Personal data is a hot topic right now, and for good reason. Never before has the public been so on edge about how companies use their information. Services like Facebook and Google now allow you to download all of the data each has on file. Soon, you'll be able to see exactly the same for Apple as well. While not available in the US yet, downloading your Apple ID information is on its way stateside. Soon, we'll be able to see all the information we've handed over to Apple throughout the years, between purchases, iCloud storage, repairs, and more. Of course, the information is attached to your Apple ID account. If you've had multiple accounts with Apple, you'll need to repeat the process for each one to see a complete collection of your data. What Data Can You Download? 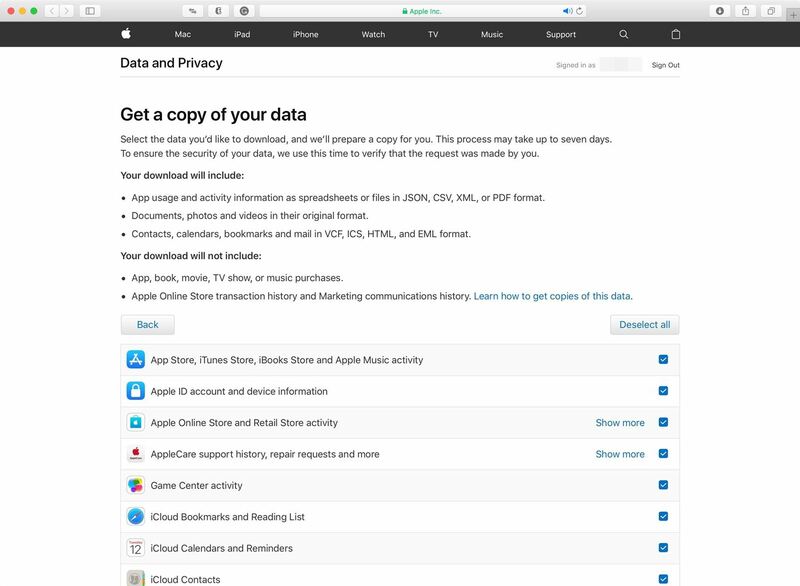 Apple offers a surprisingly large catalog of personal information users can download and view. Users can choose from 15 different data items. The company doesn't elaborate on what each item entails, so until we see for ourselves, we'll have to speculate in some areas as to the extent of each option. App Store, iTunes Store, iBooks Store, and Apple Music Activity: Apple will send you data of the apps, music, movies, books, and more you've purchased and streamed from its above-named services. This will also include your browsing history. 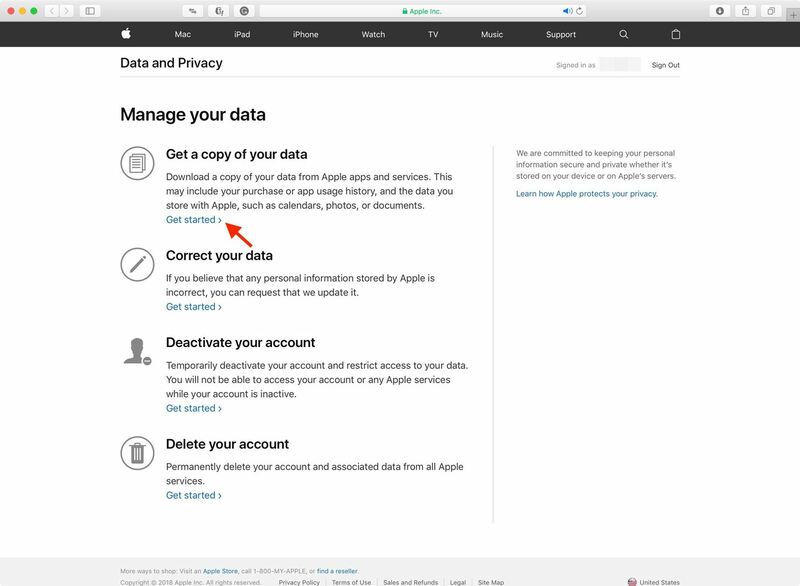 Apple ID account and device information: We expect Apple will send users a report of the age of their Apple ID, the email and contact information on file, and how many devices are connected to that account. Apple Online Store and Retail Store activity: This seems to be a receipt of all transactions made through Apple, however, Apple claims you will not receive online store transaction history. You should see your transactions through the retail store. For online shopping, this section will most likely contain surface-level information about your activity, not the sales themselves. AppleCare support history, repair requests and more: We expect a spreadsheet containing your experiences with AppleCare under your Apple ID. Game Center activity: Your Game Center account information, games you play, and data from those games. iCloud Bookmarks and Reading List: A collection of your bookmarks and Reading List from iCloud. iCloud Calendars and Reminders: All calendars and reminders connected to iCloud. iCloud Contacts: All contacts associated with your Apple ID. iCloud Notes: All notes attached to your Apple ID. Maps Report an Issue:If you've ever reported an issue in Apple's Maps app, that information will appear here. Marketing subscriptions, downloads and other activity: Apple specifies that you will not receive marketing communications history here. Other data: It isn't clear what data Apple means here. The company doesn't specify. 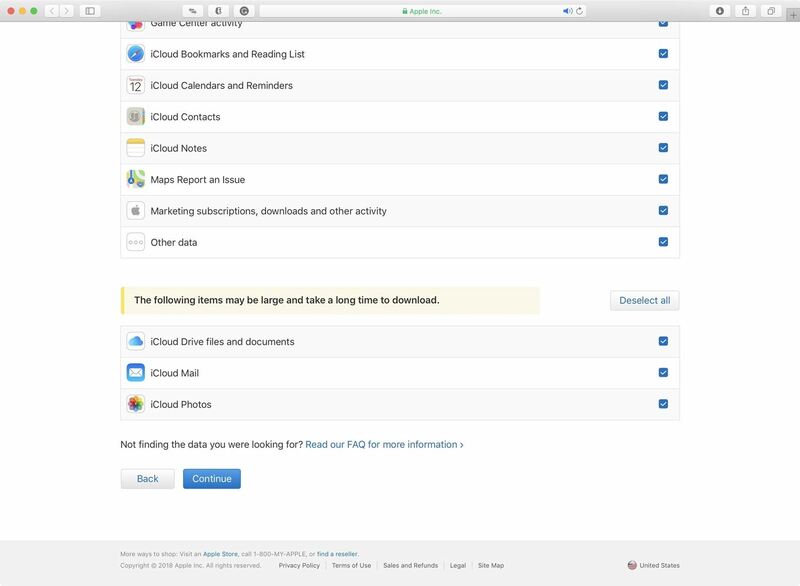 iCloud Drive files and documents: All the data you have stored in iCloud Drive. iCloud Mail: All of your iCloud Mail contents. iCloud Photos: All photos you have saved in iCloud. App usage and activity information as spreadsheets or files in JSON, CSV, XML, or PDF format. Documents, photos, and videos in their original format. Contacts, calendars, bookmarks, and mail in VCF, ICS, HTML, and EML format. Apple has made clear it won't provide certain details to you, even though you are downloading all information the company has of yours. Certain payment details and bank information will be masked, which Apple claims is for your protection against theft or fraud. You also won't see any encrypted information, such as Messages, since Apple, by nature, cannot see your encrypted data. In addition, app, book, movie, TV show, or music purchases will not accompany your download, and neither will online store transaction history and marketing communications history. If you live in the US, you'll have to wait for this service. However, if you live in the EU, where privacy laws are much more stringent thanks to the GDPR, you already have access to download your data. To start, head over to Apple's privacy page. Sign in with your Apple ID, which may require you to answer your security questions in addition to entering your password. On the following page, tap "Get Started." The next page will present you with all of your data options, as covered in the section above. You can click the checkmarks next to each item to download them individually, or click "Select all" to select every title available. When you're sure you've selected the items you want to download, click "Continue" at the bottom of the screen. Once you hit "Continue," you aren't done yet. 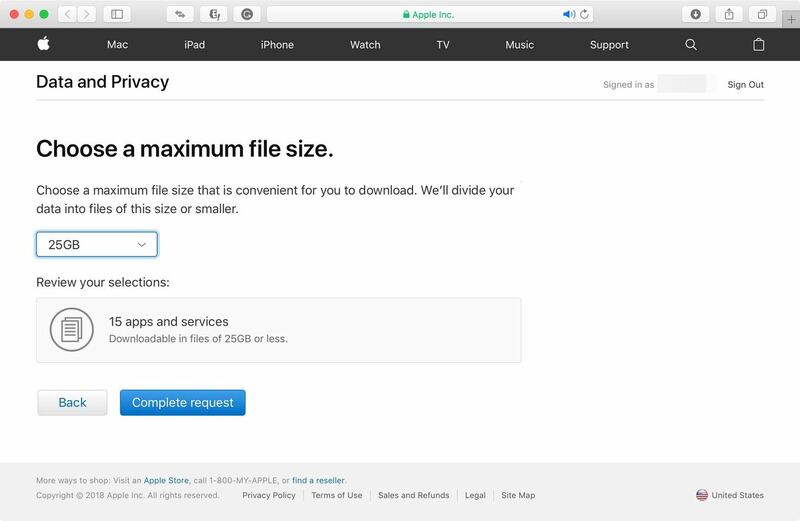 Here, Apple lets you choose a maximum file size for each of your selected items. You can go as low as 1 GB or as high as 25 GB. That doesn't necessarily mean your content will be either of those sizes, just that the overall download size for each item will be your chosen size or less. When you're ready to go, just hit "Complete request." Now, it's a waiting game. Apple states it can take up to seven days to hand over your data, due to security measures to make sure you were the one to make the request. So sit back, relax, and wait for Apple to deliver you what you've given over to them for years and years.